The first doorway I have to acknowledge tonight is the one enabled by the brand new satellite dish outside my window, which, after a three year wait for this piece of technology (and the broadband company that was finally able to provide it) enables me to blog in relative technological comfort. Apologies for the infrequent postings of late. Pollock wouldn’t have known that fractals were out there, and he certainly wasn’t a mathematician. He must have tuned into some natural process to create these. Taylor also inferred that his exploration into Pollock’s fractal-like working method could help scientists to authenticate works of art. From my work in making marks and images, there certainly is a point at which you arrive, a tuning-in to a natural process or a state of no-mind (mushin). You feel it much in the way that you know you are “in the zone”, intention, action and energy unite. Previously undreamed of possibilities emerge. And yeah, it will be authentic in every sense. 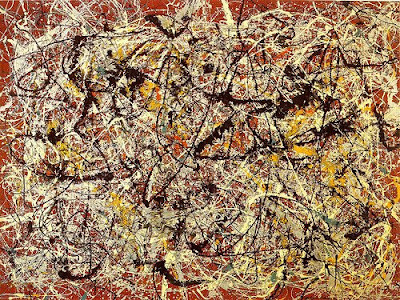 This transcendence in Pollock’s work from the time of the “drip” paintings onwards has always bothered art historians. The aesthetic progression and development of this artist just didn’t jive with the sudden greatness of his achievement. I believe that Jackson Pollock attained mushin (the no-mind, fractal-like zone) that has been the conduit of many of the arts, artifacts and disciplines I have discussed in Dear Charmides. These paintings were the byproduct of that experience. We have all experienced these moments, if only briefly. Rational order is not a prominent feature in Celtic myth. Heroes and seers who deliberately sought out other worlds in quest of power, inspiration or both, inevitably found the strange and unpredictable. Those who returned told tales of beautiful people who never aged, but also of sheep that changed from black to white and back again by jumping over a fence, shouting birds, giant ants and wondrous beasts that twisted their bones within their skins and their skins over their bones. Among Celtic people today, the doorway between ordinary reality and these other lands are still ajar. At any time, ordinary people can find themselves, suddenly and without warning, in the presence of magic. Edges are rich environments…setting the stage for interactions and exchanges that happen nowhere else. In Celtic legend, the opening between this world and another is always an edge. These include the meeting of water and land, but also the hilltops (where earth and sky meet) or openings in the earth like caves (the boundary between above and below). Vermeer, Girl with a Red Hat, c. 1666-1667, National Gallery of Art, Washington, D.C. This entry was posted on Wednesday, January 30th, 2019 at 18:47	and is filed under For Peace. You can follow any responses to this entry through the RSS 2.0 feed.